In Tripura, The MLAs of the BJP and the IPFT will meet in Agartala on March 6 to elect their leader, state BJP president Biplab Deb said. The newly elected MLAs of alliance partners NDPP, BJP and others would meet on Monday to elect senior NDPP leader Neiphiu Rio as CM candidate. NDPP secretary-general Abu Metha said the coalition is proposed to be named the People’s Democratic Alliance. “The first sitting of MLAs of the alliance partners would be held tomorrow to officially elect Rio as the leader,” Metha said. 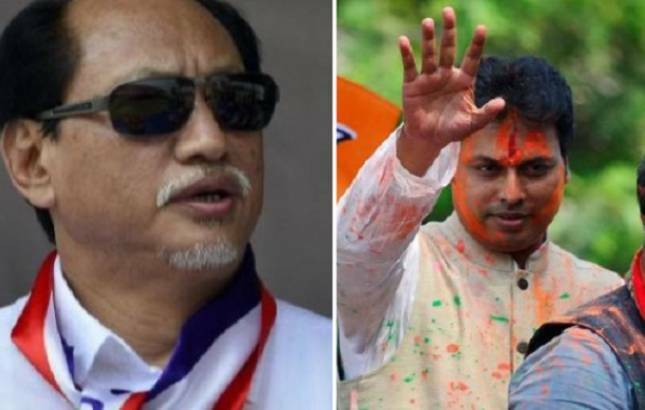 Rio, a three-time chief minister and a senior leader of the Nationalist Democratic Progressive Party (NDPP), staked claim earlier in the day to form a coalition government in Nagaland, saying he has the support of 32 MLAs. The NDPP and the BJP have won 18 and 12 seats respectively while the lone JD(U) MLA G Kaito Aye and Independent legislator Tongpang Ozukum were backing the alliance, Metha said. The MLAs of the BJP and the IPFT will meet in Agartala on March 6 to elect their leader, Tripura BJP president Biplab Deb said on Sunday, even as the saffron party’s ally demanded a respectable representation in the government. The BJP has 35 MLAs and the Indigenous People’s Front of Tripura (IPFT) has eight. Union minister Nitin Gadkari will be present at the meeting, Deb told PTI. He said Prime Minister Narendra Modi and many Union ministers are likely to attend the oath-taking ceremony. The elections in 59 seats of the 60-member Assembly were held on February 18. Polling was countermanded in one seat due to the death of a CPI(M) candidate. Meanwhile, the IPFT sought a respectable representation for its MLAs in the new state government, a day after the party and the BJP swept the Assembly polls, ending the 25-year Left Front rule in the state. IPFT president N C Debbarma also asked the BJP to select the chief minister from among the tribal MLAs. The tribal party won eight of the nine seats it had contested. The BJP won 35 seats on its own, giving it a majority in the 60-member Tripura Assembly. “We demand a respectable representation of IPFT MLAs in the new Cabinet,” Debbarma told a press conference. He, however, did not clarify what he meant by “respectable representation”. The IPFT came into being in the late 1990s and campaigned for a separate state by carving out the Tripura Tribal Areas Autonomous District Council, which constitute two-third of the state’s territory. However, it forged an alliance with the BJP on the basis of a common minimum agenda and the saffron party made it clear that it was opposed to the demand for a separate state.